Our Projects Archives - ID Studios, Inc. In 2018, we had the opportunity to work with Mission Federal Credit Union to help them move from an office they had occupied for the previous 30 years, to a new home and headquarters which was future focused to ensure flexibility to live and grow for the next 30 years. The team then sought insight into their employee’s day-to-day work lives by obtaining feedback to validate data about their daily work requirements. With those results, the team created a design that fulfilled their need for greater collaboration and openness, natural light, flexibility, wellness-focused design, and a fun, inspirational environment. 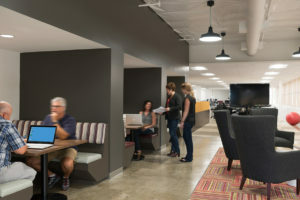 The interest in openness and collaboration drove the need for private, quiet spaces that provided an environment for employees to focus and achieve heads-down work and open spaces that provided energy and collaboration. ID Studios was able to design a wide variety of spaces to fit all of these requirements. Utilizing architectural and finish elements to convey a message of strength and reliability was equally as important to Mission Fed as creating an environment that was welcoming and approachable. Our Mission Fed Moment can be summed up by Associate and Senior Designer, Jill Russell when she said, “It was inspiring and a true pleasure to partner with Mission Federal Credit Union, Level 10 Construction, and Jones Lang LaSalle on Mission Federal Credit Union’s new headquarters.” We are very proud of what our whole team was able to achieve for such a forward-thinking company! YOU MIGHT NOT HAVE KNOWN __ ID Studios has a team of extremely talented hospitality designers within our multi-faceted studio. Project experience includes multi-family housing, restaurants, country clubs, event spaces, boutique hotels and even cruise ships! We are especially excited about the inroads ID Studios is making in the hospitality and senior living arenas. 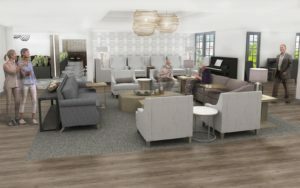 As we take on more senior living projects, our designers are integrating the resort and hospitality experiences into these projects that appeal to our retiring population. Hospitality design elements are also showing up in our corporate and creative office space. The common denominator in all of these design solutions is blending work, life, wellness and play. These unique spaces fit to our client’s needs, individual experiences and truly define a new genre of ‘place’. Our industry partners know us as a trusted advisor in the corporate and higher education realm and we hope to inspire more introductions and connections in the hospitality and senior living world as our portfolio expands. We intend to provide the hospitality and senior living industry the same high standards, knowledge base and creativity that we have been providing since our beginning 14 years ago. Stay tuned for more new and exciting hospitality and senior living projects from ID Studios. In the meantime, take a look at some of our latest projects in the works. Please contact Shaynee McMillion for more information. The IIDA SoCal held a Well Building Standard CEU at the offices of JLL San Diego and the lobby of the Aventine Building in La Jolla. It started with a tour of the lobby, and ended in the JLL flexible conferencing and entertainment area. Senior Designer, Annie Wilson, ID Studios newest Senior Project Manager, was on hand to point out all of the wonderful design features of the office. Thank you to everyone who attended. It was fun showing off the office to the design community. IIDA posted more pictures of the event on their website. Moz Metals has posted an article about Corporate Branding in The Built Environment which includes an ID Studios client, Moss Adams. With branding all around us in both the physical and digital world, corporate identity has seeped into nearly every aspect of daily life. In the 21st century, we have to ask ourselves: how can a brand establish a unique identity without getting lost in this information overload? How can a brand evoke industry values of technology, hard work, and innovation through the lived experience of its physical spaces? How can an office create a positive response from users through branding? Moss Adams office in La Jolla, Ca., designed by ID Studios. Móz metal counter fronts in Khaki with a rectilinear pattern engraved on the surface to mimic tiles. WD-40 Company’s office was featured in Hatch Magazine. The WD-40 Company has been reinventing itself ever since its founders figured out that the solvents and degreasers they were creating for the aerospace industry might also be useful to consumers with squeaky doors and rusty lawnmowers. While WD-40’s worldwide workforce has grown from 3 to 450 over the years, and its product mix has expanded well beyond that flagship lubricant in the blue and yellow can, its San Diego headquarters had been stuck in a bygone era until last August, when they moved from the Morena District to a two-story, 42,000-square-foot building in Scripps Ranch. News about WD-40 Company’s new corporate headquarters is making it’s way online. First, it showed up on OfficeSnapshots and now on Emser’s blog. Check out what all of the buzz is about! Here’s a sneak peak at a feature wall at Voit Real Estate’s new La Jolla office. 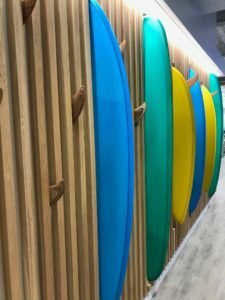 We loved designing this custom surfboard wall to show their team’s love of surfing in a new way. This stand alone, 2-story building with basement was originally designed as a movie theatre and converted to office space in 1950. Brixton Capital acquired the building with the intent to modernize it for their own Corporate Headquarters and to share with tenants. The design was based on an open concept, maximizing the coastal views of Fletcher Cove and bringing those elements into the interior of the space. The renovation features a new monument stair which took into account the circular theme inherent in the existing architecture. To see more pictures of this project, click HERE. Swinerton Renewable Energy is a division of Swinerton Builders that provides engineering, procurement, construction and monitoring of solar voltaic plants throughout North America. 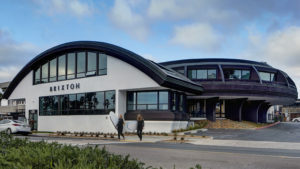 This new 24/7 facility hearkens back to ID Studio’s previous design of Swinerton Builders through similar raw interior architectural elements, but departs from that concept with a more modern and energizing material and furniture aesthetic. The focus throughout was to create a bright, comfortable and dynamic space for employees working long, sometimes overnight shifts. 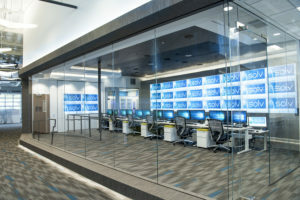 Their new center has been highlighted on Power World Analysis and on Solar Industry News. You can even watch a construction video put together by TekWorks. Another one of our projects was featured in Floor Focus Magazine, this time it’s Tealium. Copyright © ID Studios, Inc. All rights reserved.